We've all experienced the trouble of plugging or unplugging our smart devices while driving, in the dark, or when in a hurry. 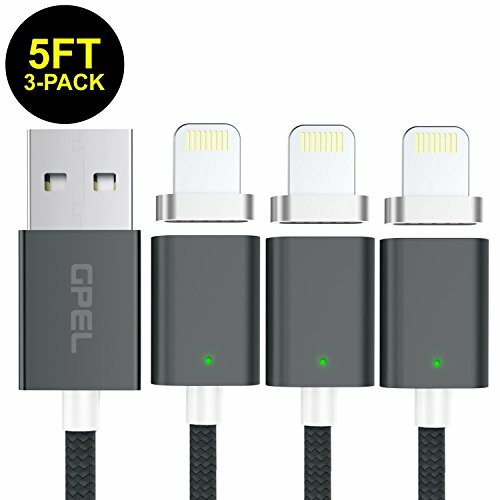 GPEL QuickTip is a revolutionary magnetic cable which makes extremely easy to attach and detach the cable from your smartphone device with just one hand while providing safe charging and data sync with built-in Overheat Protection. WHY MAGNETIC CABLE? | Extremely easy to attach and detach the cable from your smartphone device with just one hand. A simple and convenient solution that makes your charging experience easy while driving, in the dark, or simply in everyday use. SAFE DATA-SYNC & CHARGING | With built-in Overheat Protection supports safe high-speed charging up to 5V/2.4A and fast data transfer up to 480Mbps. 5 FEET CABLE LENGH WITH BUILT-IN CABLE TIE | 2 feet longer than traditional cable is ideal for usage while charging in home, cars, office travel and more while the built-in cable tie keeps the cable well organized and tidy in place. REVERSIBLE CONNECTOR | The GPEL QuickTip designed with best possible user's experience in mind featuring reversible connector. With this user-friendly design, you can charge devices freely without worrying about the orientation. If you have any questions about this product by Gpel, contact us by completing and submitting the form below. If you are looking for a specif part number, please include it with your message.